As with the upper-manual, you've also got the traditional flute, reed and string voices for the lower manual. A mellowing tab for both the upper- and lower-manual traditional voices. 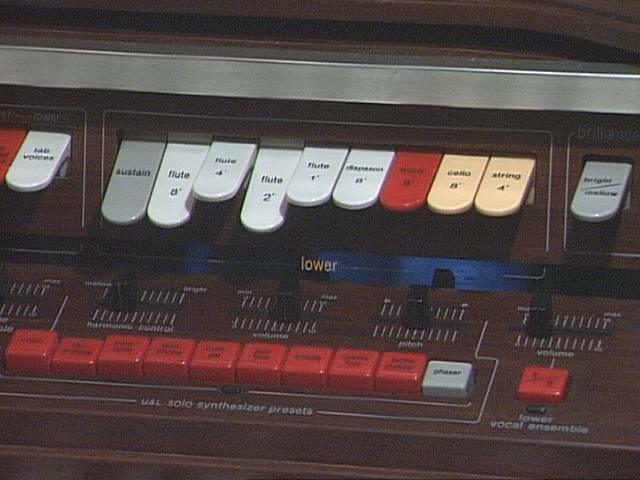 Upper- or lower-manual solo synthesiser instruments (red buttons), with brightness, volume, and pitch adjustments (I don't know why you'd want it to play an instrument out of tune with everything else, it sounds awful). And another control for varying the sound of the faked vocal ensemble, this time for the lower-manual.